As an experience for the Bar/Bat Mitzvah child and whole family, our journeys to Israel cannot be beaten — we are the best…. On this most comprehensive family tour offered in North America, you’ll be amazed, delighted and intrigued as each day unfolds. Meticulous planning by our team of experts insures a perfect blend of history, archaeology, adventure, action and just pure fun! Meet at the Airport, enjoy the farewell hugs of friends and loved ones, meet fellow travelers and board our long-anticipated Journey …. We’ll start the day with Yad Vashem, the nation’s memorial to victims of the holocaust, is an appropriate next stop. We’ll receive an introductory lecture, tour the exhibits and grounds and participate in a moving “Yizkor” (memorial) service. A short drive will bring us to Har (Mount) Herzl, military cemetery and final resting place of Theodore Herzl and many of Israel’s leaders. arrangements no later than 6 months before departure!! Terms and pertinent information: Air transportation is available from anywhere in USA and Canada. Airport transfers are included on the scheduled tour dates. All other dates are subject to a transfer charge. No refunds are made for missed sightseeing tours, missed transfers or unused hotel accommodations on tours. A deposit of $450 US per person is required to secure space on the tour and is not required for the Bar/Bat Mitzvah Celebrant (Deposit becomes non-refundable 90 days prior to departure). Insurance: Insurance will be issued 90 days prior to departure to protect your deposits and subsequent payments. Passports: Must be valid six months from the date of return. If you are not a US or Canadian passport holder please check visa requirements. Cancellation Policy: The deposit is 100% refundable up to 90 days prior to departure. Land services are subject to 50% cancellation fee up to 14 days prior to departure and 75% 14 days or less, prior to departure. Extensions:Special hotel discounts for additional nights. Special packages to Eilat, Egypt and Jordan are available!! 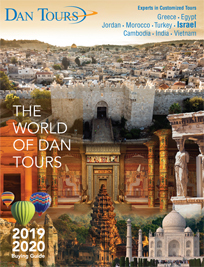 Dan Tours and Peerless Travel have gained an excellent reputation operating Family Bar/Bat Mitzvah Tours. In order to maintain this reputation we wish to advise you that minor changes may be made in the itinerary or the accommodations. These changes may occur prior to departure and even during the Tour itself. The changes are usually a result of insufficient space, changes in site schedules, safety and ease of transportation or the inability of the supplier to provide services to meet our standards. We will make every effort to ensure that any changes made to the Tour comply with our high standards. The terms and conditions printed on the back of the Dan Tours Brochure, apply to this Tour. It’s our superior customer support and service, fair pricing and professional Trip Coaches that keep our customers returning time and time again.